Cedar wood insoles combat odor and moisture, and they do it au natural. Because cedar has antibacterial properties that effectively thwart sweat and neutralize smells, it’s a smart choice to keep feet dry and comfortable. The ultra-thin, flexible, and lightweight insoles have a cotton backing and are easy to trim down to get the just-right fit in just about any shoes. They work without socks, too. Dimensions: 12.8" x 4.5" x 0.08"
Its a great product. I tried multiple similar products but nothing came even close to this. I can only recommend it for you to try it out. I am absolutely in love with these insoles! They help with sweaty feet during the summer (especially in ballet flats) and even fit into some of my high heels! And my constantly cold feet are better now, too. 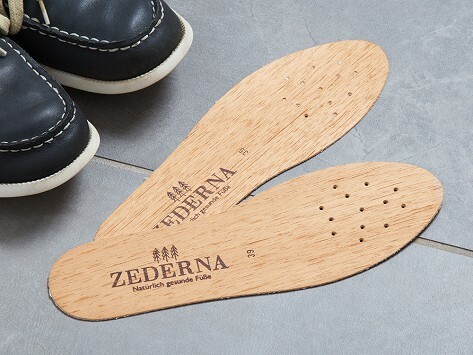 Wood inside your shoe might seem like an unlikely (and potentially uncomfortable) odor-fighting choice, but the cedar wood insoles from Zederna harness that wood’s natural antibacterial properties to neutralize smells and absorb moisture. The ultra-thin insoles are lightweight and flexible. You can even trim them down with scissors to get the just-right fit in your shoes. Cedar wood has long been used to repel insects and keep clothing fresh, like in cedar closets. It contains chemical compounds that prevent decay and eliminate bacteria so well that it’s even used to ward off athlete’s foot and fungus. The insoles are made in Germany by a family-run company to deliver a natural remedy in an eco- and foot-friendly way that will keep feet feeling and smelling good.